First attempt at a solar dinner for four. I should start by saying that I am new to solar cooking. I just got my Global Solar Oven two days ago. I was a cook/chef for 22 years, so I think I can do this. This is not in recipe format because I don’t measure unless I’m baking. Take 2 - 4 lb. 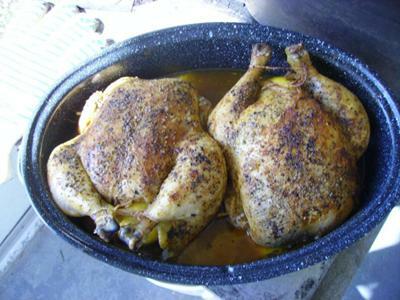 chickens, remove giblets and wash, then rub them inside, under the skin, and outside with “ Durkee St. Louis Style Chicken and Rib Rub”. (Or your favorite rub). roll 2 medium lemons on counter and pierce with a fork or heavy tooth pick several times and put 1 in each bird. Sprinkle outside with a dash kosher salt, and fresh ground black pepper, basil, and a dash of Mrs. Dash. Do this at least two hours prior to cooking. (Overnight is better). Do not use any liquid; there will be enough from the birds if you want to make a little gravy. 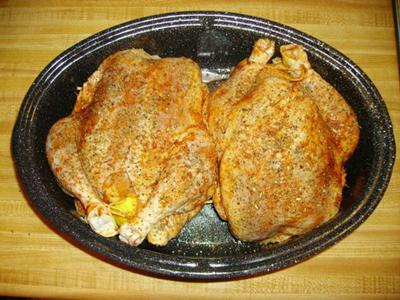 After 4 hours, check temp of birds, they should be about 170 degrees in the thickest part of breast. The skin on top should be nice and brown, but not crispy. Cover and let rest for at least ten minutes, and carve as usual. I let it sit a bit longer so I can cook some cornbread in the solar oven. 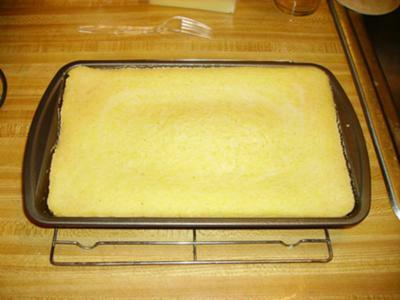 (It takes about 25-30 minutes for 2 boxes if using Martha White corn muffin mix in an 11x7x2 pan). This will feed 4 people very, very well. Conditions were partly cloudy here in central Florida, with a temp of 86 degrees and light west wind. It came out awesome! Chicken was so moist and juicy with plenty of juice for gravy. (I didn’t make gravy, but froze the juice for a future solar soup. Thank you so much for sharing your initial and maiden solar cooking attempt...it sounds like it was a success. 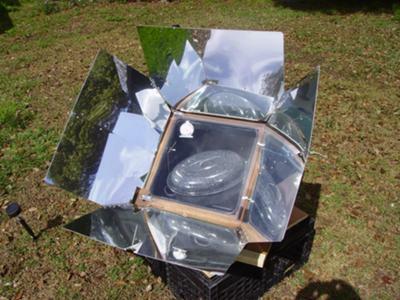 I think its great when our customers and site visitors just "jump right into solar cooking"
It serves to inspire others who are not quite sure or just getting to know solar cooking.